According to Sam Fuller’s book, A Third Face, The Day of Reckoning was the final directorial work of Sam Fuller (though not the last released). It’s not a feature film, it’s actually a 50-minute episode of the anthology program Chillers, hosted by Anthony Perkins. But this doesn’t diminish the fact that it is a Sam Fuller film at its heart, so when I realized that the storyline was going hard into an animal rights stance, I could only smile. Sam Fuller had confronted social injustice against humans throughout his filmmaking career. With White Dog he explored similar themes, but the dog was still just another method of humanity’s social injustices. With The Day of Reckoning, Fuller goes one step further and takes on factory farming and the injustices done to chickens in the name of the almighty dollar. The story, based on a Patricia Highsmith short story, concerns Jean, a man traveling to his uncle’s chicken farm. He plans to live and work there, and perhaps learn the trade of industrial chicken farming. When he arrives, his aunt and uncle are not around so he wanders through their egg production plant. 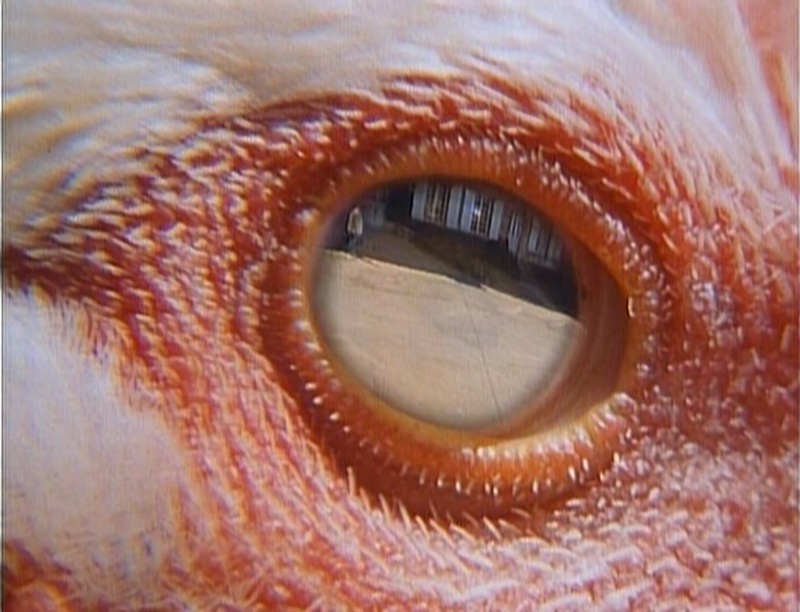 As a viewer, this “tour” through the facility was a novel one, allowing us to see the inner workings of an egg farm. But as soon as Jean meets up with his uncle, the real tour begins. Jean’s uncle takes him around the facility, opening door after door to the darkened rooms full of hens laying eggs, all while expounding on the virtues of the money the farm has brought his family. The hens are smashed into small cages, their necks nothing more than flesh, the feathers long since pecked and worn off. 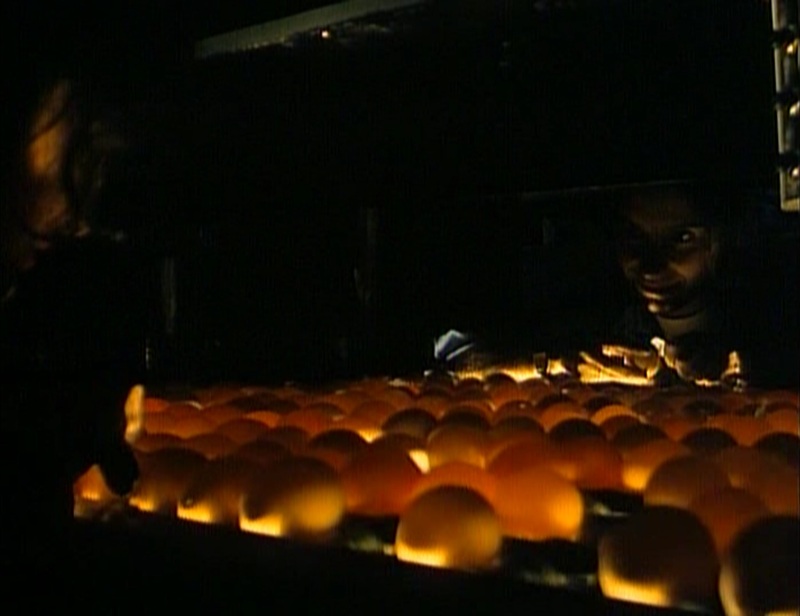 These scenes of horror are inter-cut with Jean’s aunt tending the conveyor belts full of thousands and thousands of eggs. These three concurrent scenes continue on and on; we can’t get away from the oppressive horror of what the chickens are going through. Forced into darkness to trick their minds into thinking spring is longer than it actually is, the hens lay a multitude of eggs. The farmer feels nothing but pride at how much money he is making, even spending his nights pouring over the farm’s books, “reckoning” as he calls it, hunting for ways in which to increase the efficiency of the operation to make him even more money. We are assaulted by these images, just as Jean is, and this is exactly Fuller’s intention. The film takes something of a nosedive after this point, though, both into fun B-Movie thrills and just plain bad. The good is definitely worthwhile for those that like weird stuff; I can’t think of any other films with a black-and-white dream sequence featuring a talking rooster and a chorus of hens singing backup on Old MacDonald Had a Farm. There’s also the very strange score that sounds super ’70s, with Miles Davis-inspired trumpet work over synthesizer grooves, and no less than four renditions of Old MacDonald. My favorite bit of the score was the synth stinger that played every time Fuller showed a close-up of the rooster that was allowed to live outside. Not only does it suggest a sentience and purpose to the rooster’s actions, it’s just fun! Feel free to hit that play button below every time I mention the rooster to add to the experience. While I respect its good qualities and its social commentary, I still didn’t find The Day of Reckoning all that enjoyable to watch. It’s pretty slow-paced and it features some absolutely horrid dubbing. I’m pretty much always against dubbing, but what’s infuriating about the dubbing heard here is that it’s only one character that gets a wildly over-the-top, exaggerated, stereotypically bad dubbed voice. And this guy talks A LOT! The comical dubbing makes it nearly impossible to take the man’s scenes seriously, and this is exaggerated even more in the moments when the character is supposed to be showing real emotion. 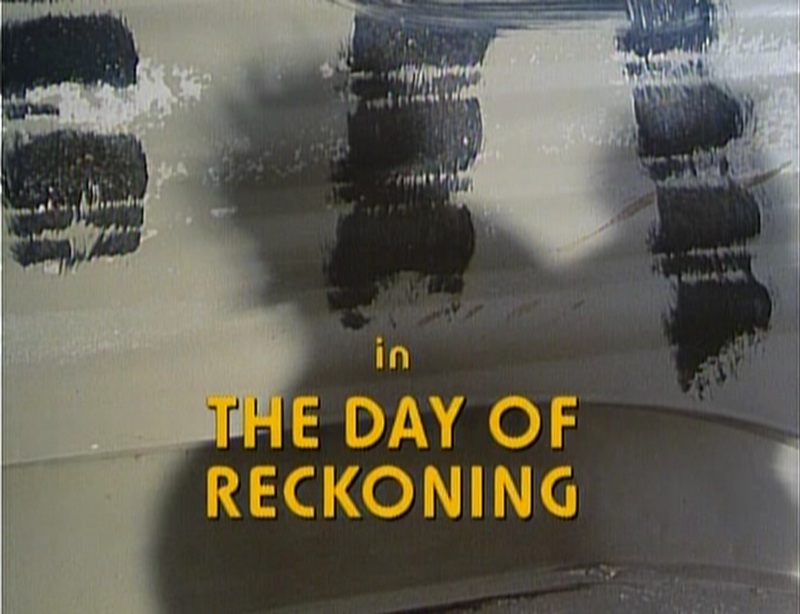 Despite its low-budget and its very noticeable flaws, I still found a good amount to be intrigued by in The Day of Reckoning. I’d say it’s definitely worthwhile to Fuller fans who wish to see him take on animal cruelty as only he can, years before it became a hot-button issue. This film was almost impossible to get ahold of for years, but a while back it came out on this budget DVD, and can be picked up for a relatively cheap amount (as of this writing). No trailer, but here’s a piece of the dream sequence.